You could try a SelfState to make P2 go to their own fall state and have PrevStateno = stateno their in the bubble as the trigger so it can read that they were already trapped in the bubble when the new bubble hits. You can try and see if that'll work. Have you tried taking a look at The_None's Thanos? Try and get that Thanos and look at how this Thanos' Death Bubble is coded. You might get the idea how it'll work. in this case that don´t help me, cause the giant sphere is broken when I throw another bubble, in MvC2 the giant sphere it´s still in the enemy if you throw the bubble. The only thing that I can get of this, is the little bubbles that appears when I throw another bubble and crash into the sphere. That´s is the easy way, now I have to see that when I throw another bubble when the enemy it´s trapped not create an loop, and throw infinities bubbles, maybe a ignorehitpause there, I have to try it. Anyway that is the most complicated thing. then the last thing, the small bubbles that appears when you throw the bubble and crash into the sphere, it´s simple I think, you put an Explod there with a "triggerall = movecontact - trigger1 = p2stateno =1045", and maybe that could work. Fixed that!, In this week one Character in the Marvel side will be released (I didn´t want to release something that contains this bug!). Hi!, Iron Man it´s released RIGHT NOW!, with the Original MvC2 1vs1 gameplay (as faithfull as possible) - 6 button gameplay edition. The original author is One Winged Angel, in fact is his War Machine, but Unko Man do some little edits to add some sprites, and sounds to play as IronMan in One Winged Angel´s War Machine. 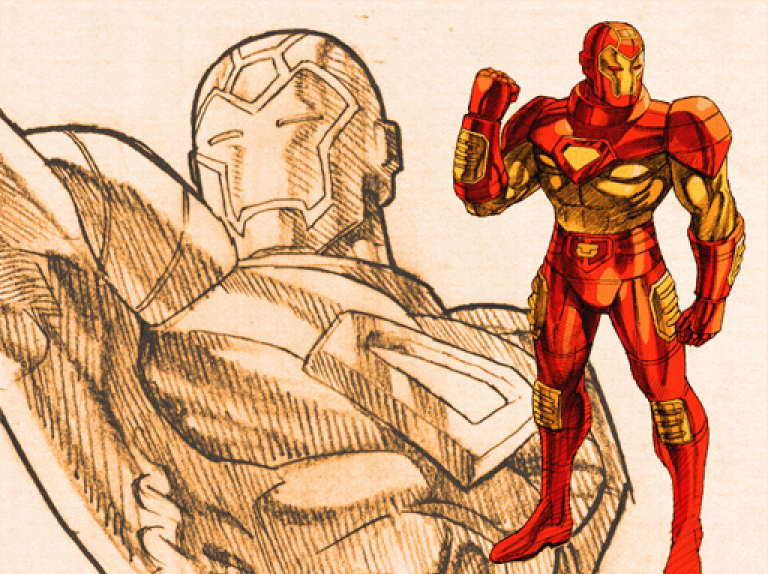 This edition is made with a lot of effort to try to improve Iron Man in MvC2 gameplay, this character was not worsened to offend the great work of the original author. 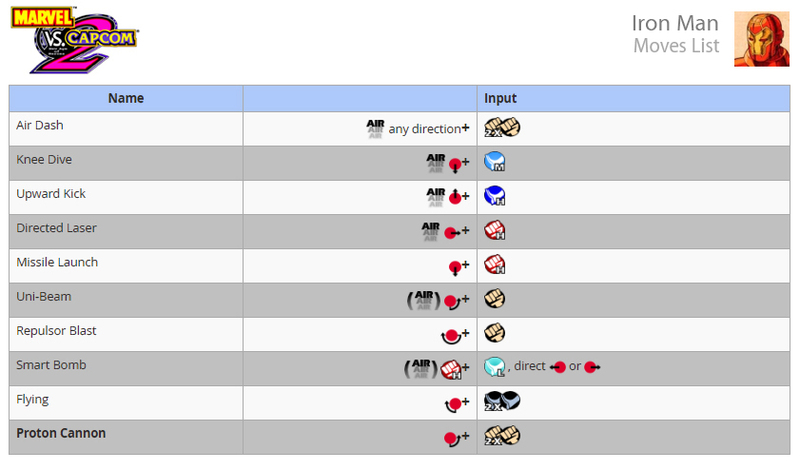 - Hitdef and some codes in all hyper moves (to an original MvC2 gameplay as faithfull as possible). 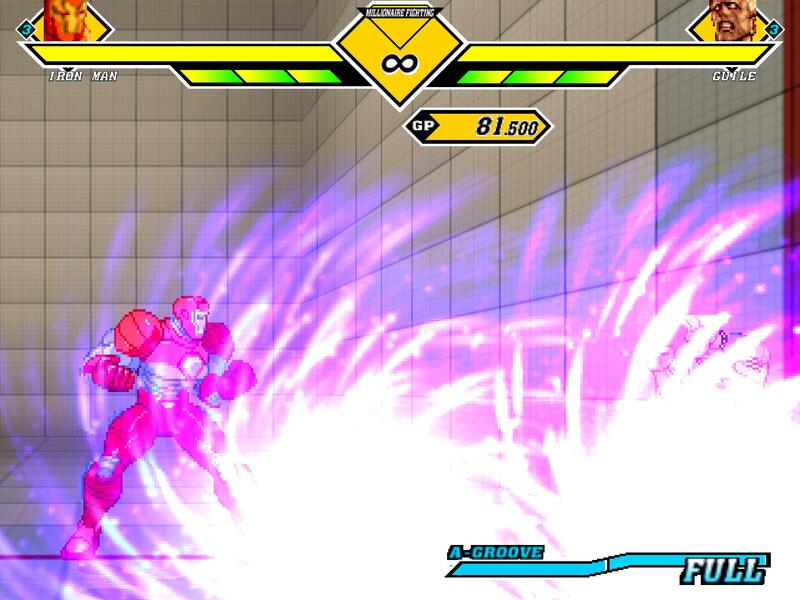 - New FX (to the original MvC2 game as faithfull as possible). You want to help me to perfect Iron Man? - For some reason the Jumping Strong punch (upward) if you press up and back at the same time, this don´t work... but only in this state.. this work in Jumping Strong Punch (Downward) (obviusly if you press down and back) I don´t know why, maybe there´s some thing that I don´t see it. - MUGEN Don´t recognize combo messages in Iron Man Hypers, there some thing in that code that I can´t find it to fix this. In this case, I could do some similary thing. - It´s possible to cancel all the "normals" hit sounds? and ONLY hear the metal hits when in this case, hit Iron man? Looks Sick! I'll probably do a full game later on in the months! Any plans on doing DCL's Work? I don´t know much about DCL´s works, and how many characters he released. Anyway I have all the list ready, I mean all the next characters. But when I start to work in some of them, I don´t think in some author in particular. 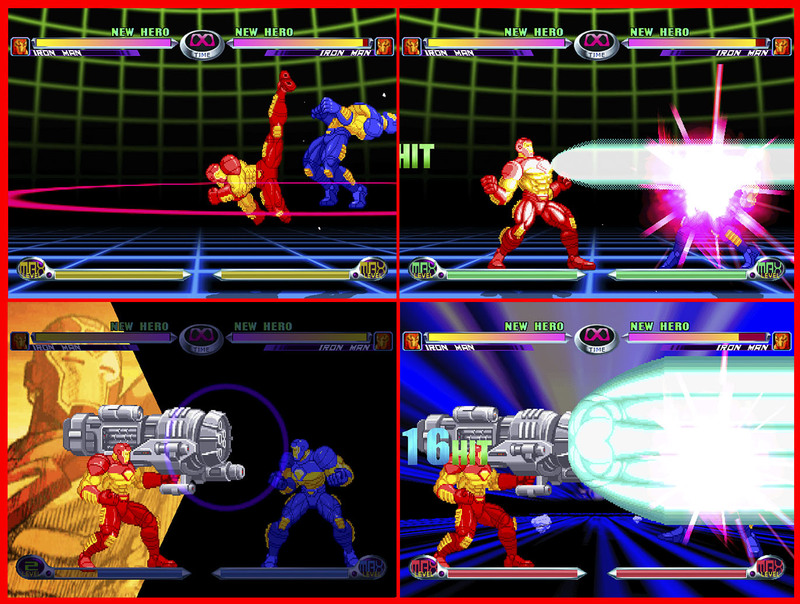 For example, if I´m working with IronMan, First, I download all the Iron Mans that there exist in MUGEN (obviusly with MvC system). I try all of them and I analize them. 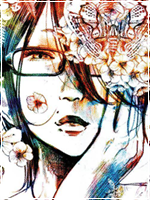 The one that I considerer the best did it, is the one that I´m will work/edit. So if DCL did a MvC character bur other else did a better job in THAT character, that DCL´s character is descarted. all to reduce time and work, and to make things right. Hi REDHOT, you are making a amazing work! Well, You have plans to make a definitive Ghost Rider MvC Style and bring him here to your great project? I belive that id a good ideia because your intention is make the definitive characters and you are a big creator, I known that you are able to make a amazing Ghost Rider. REDHOT wrote "Something to say?" and "all are welcome". I can't wait for you to conplete the whole roster! I'll probably do a MvC2 Game in the near future! My objetive it´s only to complete the 56 MvC2 characters (complete and make them as perfect as possible). Well the 55 ´cause will be only one Wolverine, I´m pretty sure that the 56 is Norimaro. When I released the v1 of all the 56, I´ll fix and perfect all the things in every character (in the same order). Will there be any other mvc2 custom characters in it? Like Batsu by Mouser, Bad Megaman by Mouser, all the edit chars by Darkwolf13 etc? -Attacking any of Warusaki's cvs characters with Ironman's standing HP leaves a purple fx sprite behind when they bounce against the ground. That´s because Warusaki´cvs characters has that purrple fx in the anim "8010". My characters have the fall fx in that number too. For my side it is impossible to prevent that, always will be a character in MUGEN that have some fx in some number that I occuped with my fx.. so if I used an explod with some fx in an custom state (inside of a p2stateno), could happen that. You can edit that yourself..
1) Open the fighterfactory and after the state of SSP, find the Explod with the anim "8010" inside the custom state, erase it. 2) Or duplicate the 8010 anim, with other number that it´s empty (8011.. 8012...), find the explod with the anim "8010", and put the new number. I´m working with the game open (dreamcast emulator), and I try to simulate all that I can. Analize all the characters in all the others games (MSH, Xmen., MVC...), it´s a long time to me and for do the job that you say I have to do that, open the 3 o 4 games in time. First I will do the things right... working with MvC2. When I released all the v1´s characters, will see. Iron Man - OTG C.LK causes the opponent to fall through the floor. Any explaination of when that happens?